I would be willing to give this pencil a shot again, but due to the nature of my experience and how quickly the graphite wore for me, I definitely do not see the Nataraj 621 becoming an every day pencil. Overall 4/10. Nataraj was a pencil brand I had never heard of until I found it in Caroline Weaver's shop online. After doing a bit of research, I found out that Nataraj was a brand from the company Hindustan Pencils Pvt. Ltd out of India. Established in 1958 and touted as the largest pencil manufacturer in India, Hindustan Pencils has become a household name in India and exports to 50 different countries. Hindustan has a state-of-the-art manufacturing facility that can produce 8 million pencils a day. 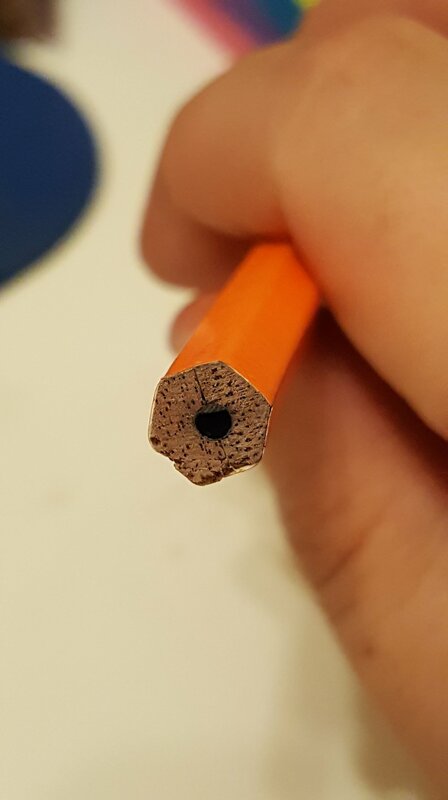 Upon sharpening the pencil for the first time, I was perplexed. The wood grain was unlike anything I have ever seen before. On Hindustan's website they state that they "...do not use any forest wood for manufacturing pencils...we procure wood from the farmers who either grow trees on their farm, land or in the court yard of their residential premises. This practice ensures an uninterrupted supply of wood of consistent quality. It also helps protect bio-diversity and maintain ecological balance." It is reassuring to know that they are following environmentally conscious practices, but I am really curious what woods they are actually using. Nonetheless, I miss the rich smell of cedar.